Like every time Google dedicates to the world's great people by putting a doodle on the search engine. On Tuesday (May 29th) Google, through its doodle, the Danish scientist S.P.L , He did an important research in the field of chemistry dedicated to Sørensen. Full name is Søren Peder Lauritz Sørensen was a Danish chemist, famous for the introduction of the concept of pH, a scale for measuring acidity and alkalinity. 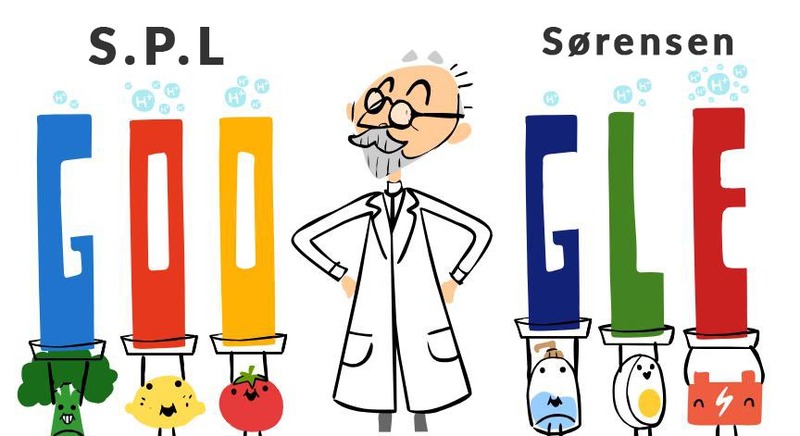 He discovered the pH scale in the field of chemistry. The pH scale is a kind of global metric. This measures the acidic amount of a substance. pH is a measure of hydrogen ion concentration; a measure of the acidity or alkalinity of a solution. The pH scale usually ranges from 0 to 14.
while those with a pH greater than seven are basic or alkaline. pH of 7 is considered perfectly neutral. Pure water has a pH of 7, although in nature, water is often slightly basic or slightly acidic depending on what other chemicals are dissolved in it. The acid in your stomach has a pH of 2, while the acid in your car battery has a pH of 1. Most colas have a pH of about 2.5, while orange juice has a ph of about 3. Coffee has a pH of around 5. At the other end of the scale, undiluted bleach is very basic, with a pH of about 12. Ammonia isn't far behind with a pH of about 11.5. The hand soap in your kitchen has a pH around 9 or 10, and most shampoo is only slightly basic with a pH of about 8. Your blood actually has a normal pH just slightly above 7.